"... every new beginning comes from some other beginning's end..."
Thought that now might be the best time to let everyone know that I will not be continuing in any formal management position with the team from next season. Which many may have guessed anyway. Why? Well I think if Mel had added "... oh, you do realise that you'll be helping to run the team until practically the end of the decade" to her "Do you know where I can play rugby..." enquiry back in late 2002 I might have been slightly less enthusiastic about helping out at the start! However my aim from 2-3 years ago was always to gradually step back from things and now seems the best time to step away, more or less, entirely. More importantly it will also create a small vacancy for someone to work with Mike and Heather throughout what will presumably be their final season next year with the aim of taking over in 2010. So if you will still be a junior in the 2010/11 season now is the time to push a parent forward. Seriously - this is very important. Such is the way this game works that running the girls team probably requires as much off-field effort as running virtually an entire boys' rugby structure from 6-18. Maybe more. Understanding the rules and the unwritten rules and the Ways We Do Things in women's and girls' rugby requires a bit of an apprenticeship. You need to know what you are doing and who to talk to - without which the team just would not get onto the field. So - and I guess this means our small band of U15s - start badgering now! Not that its all hard work - it is, and has been, staggeringly rewarding (in the non-financial sense of the word!). Its quite strange to stand back sometimes and watch and listen to you all and remember when we or you first started. This season ends with so many of the girls who started the team moving on - next season only Nikki will remain (plus Ruby, if her back ever allows her to play again) - so its a good time for me to step down as well. However, I won't disappear entirely. Mike has asked that I carry on managing this blog - which I will - along with the Herts RFU website, which I have just taken over (requires a lot of work!). And I'll certainly come along to watch the games! But that is all in the future. We still have two months of this season to go, including five tournaments and - in one of them - our 200th match. Any idea how we might celebrate that? D-Day from the ELVs is, apparently, a mere few weeks away. On 13th May in London a two-day IRB meeting will be looking at the evidence of the worldwide trial - and despite the massive pro-ELV PR campaign it doesn't look good. The way in which many top level games have decended into aerial ping-pong is an unexpected but common complaint. ELV supporters say that this just shows unimaginative coaching, but such is the growing tide of disatisfaction that it is possible that the entire ELV collection could be thrown out - even the bits that people say they like. Certainly whispers in the press hint that the pulling down of mauls is dead in the water and variable number in the lineout also seems in trouble, surprisingly. However, even the five metres at the scrum rule is under threat, according to many correspondents. Indeed, as you read around, the impression you get is that there is even a growing counter-revolution campaigning to remove older law changes around things like the ruck, which some say made the game "safer" at the loss of fluidity. So - watch the press - there could be yet more changes to your game before the start of next season. “These two tournaments [the Sevens and XVs World Cups], in conjunction with a global qualification process and existing tournament structures, will guarantee an unprecedented level of elite Women’s competition for around 90 Unions over the next two years. This expanded competition pathway underpinned by the Women’s Strategic Plan point to what promises to be the most competitive Women’s Rugby World Cup ever in 2010” (IRB Press release). Ninety unions to be involved - wow! Since then... silence. News about the European qualification process leaked out a few months ago, but only today has full details come to light - and not in an IRB press release, but in a letter to the unions that one or two have passed on to me. Which makes what follows therefore something of a World Exclusive! So, Bernard said 90 unions. Optimistic - so how many unions do you think will actually have a chance to compete for a place in London next year? 90 - the number of unions Bernard said would take part? No. 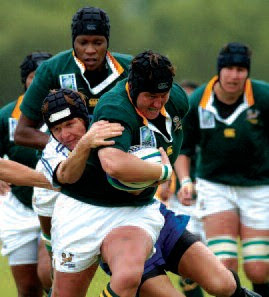 83 - the number the IRB claim took part in the qualification process for the Sevens World Cup? No. 70 - the number that actually took part in the above process? No. 50 - the number of unions that have played 15-a-side internationals in recent years? No. No - the number of countries who will have a chance to compete for next season's "World" Cup will probably be somewhere between 19 and 25 - barely a quarter to a third of the countries with active women's rugby teams. Europe. 12 nations will compete for six places in the tournament. England, Wales, Ireland and France have now qualified via the Six Nations - Italy and Scotland will play off for the final two places against Spain, Netherlands, Russia, Sweden, Germany and Belgium next month. Nations with active 15-a-side denied any chance to compete for a place include Romania, Finland, Luxembourg, Norway and Serbia. North America. USA and Canada will qualify. No other nation in North America or the Caribbean will be given any chance to compete - this denies access to Trinidad, Jamaica, Barbados, Guyana, Cayman Islands, and Bermuda. South America. No South American nations will be given any chance to compete for a place in the World Cup. So no hope us to see the players from the sevens sensations Brazil, for example. Asia. One qualifier from a tournament, details to be announced. Teams taking part in the are likely to (but will not necessarily) include Japan, Kazakhstan, Hong Kong, China, Thailand, and Singapore. Africa. South Africa qualify automatically. So no chance for the very active women's teams from Uganda or Kenya, leave alone Rwanda, Zambia or Zimbabwe, among others. Oceania. New Zealand qualify automatically, Australia will play-off against Samoa. So the door is shut on Fiji and Tonga. In the limited time available this might be said to be inevitable - but why is time limited? Because the IRB left the announcement of the venue for the 2010 World Cup until less than two years before the tournament was due take place. Its not Finland's fault, or Uganda's - its the IRBs. And, yes, it has to be said that none of the teams missing out would have been likely to exactly trouble the major nations, or even those favoured with the chance to take part. But - frankly - if that attitude is taken to its logical conclusion you may as well save a bob or two by cutting straight to the inevitable England vs New Zealand final. The whole point about tournament like these is the excitement they build in even the smallest, most lowly ranked countries. Look at Sweden, for example, who have a chance to qualify but - in all probability - won't. Despite that look at the excitement this is generating - training camps, tours, publicity. Why is this denied to Fiji, Trinidad and Brazil? But above all what gets me is the deceit. The big press launches with big numbers thrown around showing how strong the women's game is and how much it is expanding and how much the IRB support it when the truth is they can't be bothered to organise (or are incapable or organising) a World Cup to which the world is invited. News of an earlier draft of next season's calendar appeared on here in January, but now a new version has appeared - with a few amendments. So - is this a Damascus moment? have RFUW seen the light? Have they responded to the debates about the value of regional rugby? Or the need to assist and defend the grassroots club game? I don't suppose any comment is needed - the above speaks volumes as it stands. And its all been said before and clearly no-one is listening. Just a reminder - 10 o'clock to 11.30. Information about Gloucester Tens - the "unofficial" replacement for the cancelled National 10s - is now available, and it sounds like being an amazing weekend. Despite everything that the RFUW could do, 18 teams will be taking part - 10 U18s and 8 U15s. While its down a bit from what was originally hoped for, we all know whose fault that was, and that is now history. Its time to look forward - and there is much to look forward to. Both days should finish c5pm. The RAF Challenge will be a "physical and mental fun team challenge" - so it sounds a bit like the old Herts Superteams which we tended to do pretty well in (well, Mel's team did!). Its a great idea as it will fill the gaps between games which is often a problem a festivals. Plus awards for the "RAF Challenge" competition! A number of teams have requested an entertainment theme, so to help make the "barbarian" teams feel more at home, we suggest "famous female barbarian / warrior heroes" - so you are welcome to dress as Roman, Celtic warriors (Boadecea) or as Amazon tribal warriors, be it the "sheet wearing" tribe or the grass skirted ones from Africa or even those from other planets!! (Whatever it is, please make it easy to put on/remove to accomodate the busy "double challenge" during the day!). The question of media coverage of women's sport has hit the press this week. Its taken until today'' for me to notice, partly because I don't read the Independent, but also because I'm not a close listener to Radio 4's Woman's Hour. However, I did catch the tail end of a repeat of the broadcast today - and if you are interested in this subject (and you should be) then both it and the two newspaper articles that prompted it are well worth listening to or reading. The debate stems not from rugby but from coverage of the women's cricket success last week - but the arguments apply to all sports, including rugby. It began on Monday when Andy Burnham - Secretary of State for Culture, Media and Sport - wrote an article called "Why is women's sport treated as a sideshow?". This was followed the following by an article from Dominic Lawson arguing the other way, and then on Wednesday by the Woman's Hour broadcast (which you can listen to here - its about 10 minutes long). All three items invite responses and feedback - if you have anything to say please use them. The newspaper articles have comments links at the bottom, and the radio programme can be contacted via this feedback form. Obviously I'm with Andy Burnham here, but I'd have to say that when it comes to rugby he probably underestimate the problem! Incidentally, if you want to write to Andy Burnham directly, and not via his newspaper, I suggest you do so via your MP. That's Oliver Heald if you live in Letchworth, or Peter Lilley if you live in Hitchin - if you live elsewhere go here. The reason to go through your MP is that ministers, like Andy Burnham, normally have to sign letters they receive via an MP - so at least they will see your letter. Anything going straight to his department will just go to the ministerial correspondence section and you'll probably just get a standard reply. Women's team to feature on this week's "Big Tackle"
"At second to the bottom of the league, their skill levels, commitment and recruitment issues are leading to relegation. Austin calls upon the dynamic Danny Care to inject some energy and aggression into the team. The England Ladies also pitch up to put the raucous ‘Angels’ through their paces. Will Witney be convinced by Austin’s pitch-side advice as much as his off-duty dancing in the clubhouse?" Entertaining programme? Useful tips and ideas? 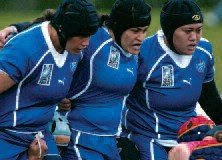 A positive view of women's rugby - or patronising embarrassment? We shall see..
Incidentally, Mr Healey is seeking new clubs to visit for his next series, so if anyone fancies him dropping by all you need do is send 50 enticing words to the RFU at this address. The IRB have issued an attractive guide to "rugby for beginners". Available in a number of languages (see here for complete list) its well written and illustrated - even including (if you look carefully) a photograph of women players in action! That said one picture out of about 40 or so is a bit poor given that one player in fifteen is female, and - given the multitude of attractive, athletic photos out there of women players - the choice of a slightly scarey image of the Kazakhstan front row about to pack down (see page 6, and right) as the sole visual represention the women's game is a fairly odd one... but I guess its better than nothing at all which, I have to admit, is kind of what I expected. However, there may be a second photo at the foot of page 8 (and left)... its difficult to be certain about the gender of the players depicted... what do you think? But, to be fair, its pretty good and all one might ask is where you get copies from... which the IRB do not tell us. Maybe we are we all expected to use just the electonic copy... in which case wouldn't a set of web pages be better than a pdf? The next training session for both age bands will be on Sunday starting at 10am. Final reminder about Saracens v. Wasps on Sunday afternoon. There is a coach going from Letchworth club at 1.30pm to the Vicarage road ground. Cost of the coach is £6 and the match tickets are £15 for 17 and older or £5 for under 17s. If you haven't already got a ticket and want one, please let Wonky or Mike know a.s.a.p. Also, please let them know if you wish to go on the coach. The success of the Irish team in this year Six Nations (and last, come to that) is having an effect on the publicity they are getting (like they are getting some) - the latest being an outing in the Fashion and Beauty pages of the Irish Independent, the country's leading quality newspaper. Its a long article, and quite interesting - though I do wonder to what extent articles concentrating on the players' looks are a good or bad thing. I guess its necessary at least counter the stereotype that Orla Brennan talks about (and one that is not restricted to rugby by a long way) but I can't say that I'm too comfortable about it. What do you all think? Admittedly these are probably more positive images, at least so far as recruitment is concerned, than this growing collection of images compiled by Scrumhalf Connection - makes Hayley's eye seem a very minor injury! There are precious few images - or come to that records - from women's rugby history before the 1980s, so this 1930s team photo from the archives of the New South Wales State Library is a real rarity. Women's rugby was popular in parts of Australia in the 1930s before disappearing during the war, not being revived until 50 years later. Just came across the Yeti's pre-tour publicity in their local newspaper - the Salmon Arm Observer. Its always interesting to see how you are looked at from afar... far be it for me to comment on its accuracy! Possibly our most remote mention in a newspaper to date (well, in terms of mileage perhaps) - though didn't we did get namechecked in a Russian paper once, I think?